Synopsis: A young couple gets more than they bargained for when they buy an historic bed and breakfast in New England only to discover that the old house is hiding a dark secret within its walls. It takes quite a bit to get John Carpenter to direct a movie these days. The last movie he made was five years ago, 2010’s The Ward, and even that he didn’t write himself; it was written by a couple of brothers named Michael and Shawn Rasmussen. Not long ago, the Rasmussens made their directorial debut with Dark Feed, an eerie little flick that didn’t quite live up to the success of The Ward, but tagged the brothers as two to watch in the future. Their new movie, The Inhabitants, may not be quite as good as The Ward either, but it’s a definite step in the right direction. The Inhabitants is about a young couple named Jessica and Dan (Elise Couture Stone and Michael Reed, both of whom were also in Dark Feed) who purchase a quaint little bed and breakfast called The March Carriage House in rural New England. While researching the history of their new home, Jessica learns that the old owner of the house, Lydia March, was accused of witchcraft and hanged in 1669. Not long after she makes this discovery, Jessica begins to have strange experiences in the house, things like getting weird phone calls and seeing phantom figures prowling around the grounds. Dan notices strange things, too, but not about the house; Jessica is acting oddly towards him. Dan wonders if the history of the house has spooked Jessica, or if something more sinister is afoot. Haunted house movies have come back into style with a vengeance since The Conjuring, so they need to have a little extra something to stand out. Fortunately, The Inhabitants has it; it’s not just a typical bump-in-the-night ghost story. Sure, things do go bump-in-the-night, but there’s much more to the creepy and atmospheric movie than that and, best of all, it keeps the viewer wondering what that much more is until the very end. Of course, it draws obvious comparisons to modern movies like The Innkeepers and The Woman in Black, but it’s also full of mystery in a way that recalls classics like The Changeling and The Sentinel. Who knows if it’s even ghosts behind the creaking floorboards and slamming doors? Maybe the trouble is witches, or neighborhood kids, or raccoons in the attic. It’s the mystery that makes The Inhabitants fun. (Okay, at the risk of spoiling it, I’ll admit that it’s not raccoons in the attic – but that’s all you’re going to get out of me!). The Inhabitants has the same flaws as any other indie horror picture. The acting is spotty (however, the weaker actors are in supporting roles, as Elise Couture Stone and Michael Reed are both great), the visual effects are limited, and the cinematography looks, well, like an indie horror film. But none of that detracts from the film. The Inhabitants has something that most low-budget fright flicks do not; a great story. A big part of what makes The Inhabitants an effective horror movie is the sound effects. Sound designers Kenny Kusiak and P. Andrew Willis build maddening suspense with layers of whispery, windy ambient sound that keeps the viewer on edge the entire time the characters are in the house. As if that’s not enough, every once in a while, at strategic intervals, they’ll toss in a barely-noticeable “Lydiaaaaaaaa” into the mix that further induces goosebumps among the audience. For the big payoffs and sudden scares, the audio will disorient the viewer with unsettling ear-ringing and pitched buzzing effects, just enough to keep the audience from ever quite calming down. It’s the kind of thing that is very subtle, but also very effective. The soundscape in The Inhabitants is masterfully crafted for maximum creepiness. 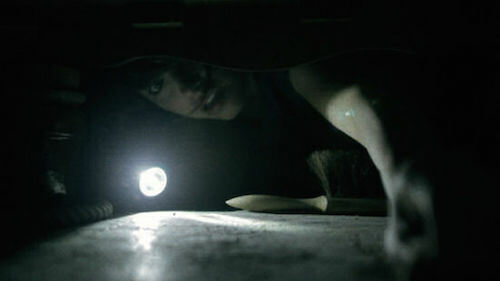 Because the audio in The Inhabitants is so well done, most of the good scares are set up by the skillful sound design. Although some of the scares do make the audience jump, it’s not really fair to call them jump scares, because that implies that they are cheap. They’re not. The aural and visual components of the film work hand in hand, building tension and releasing it with a style and panache, not just with a cat jumping at the camera. There’s some good freaky paranormal stuff that goes on in the film as well, and there are a few instances of cringe-worthy grossness too, but most of the scares are good old fashioned tension and release. And it’s effective. And damned scary.